Direct Selling Company - Tavares Group Consulting Inc.
Amway is ranked as the world’s #1 direct selling company in the 2014 and 2015 Direct Selling News Global 100. 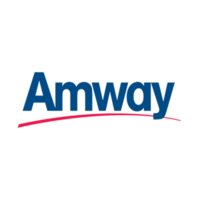 In business since 1959, Amway is located in more than 100 countries and territories. The company supports millions of active participants, called Amway Business Owners (ABOs) or Independent Business Owners (IBOs) who sell Amway products and share the Amway business opportunity with others. Globally, Amway is committed to being a responsible and sustainable corporation through its economic, social, and environmental performance. As the first of Amway’s 57 international affiliates, Amway Canada Corporation (ACC) has been in business since 1962. With tens of thousands of IBOs across Canada and 65 employees in the London, Ontario Canadian head office, Amway Canada plays a significant role in Amway’s global sustainability initiatives. Over the years, Amway has been implementing sustainability programs across its international affiliates, including sustainable development of Amway products, the AmwayTM ONE by ONE Campaign for ChildrenTM (a global initiative to help children in need to achieve their potential), and the NutriliteTM Power of Five Campaign (a global initiative to collect donations and to distribute child nutrition product NutriliteTM Little Bits (in order to increase the awareness of health and nutrition). ACC promotes its sustainability initiatives through partnerships with several organizations, including the City of London, London Clean & Green, Easter Seals, and the London Cares Curb Hunger Food Drive, fundraising for charitable programs, serving as a compost depot, and engaging employees in community clean-up programs like The 20 Minute Make-Over. Despite those initiatives, ACC does not have a formal sustainability plan that addresses its economic, social, and environmental performance. In addition, following a corporate restructure in 2009, much of ACC’s previous sustainability momentum was lost, with the loss of the previous Environmental Committee. Five metrics, including non-hazardous waste, hazardous waste, energy, water, and stakeholder engagement, were selected to be assessed using the Toolkit’s process-based approach. The selection was based on ACC’s demand priority and ability to influence change. Although many sustainability programs exist at ACC, the gap analysis revealed the need for a formal review of existing initiatives and the development of a formal Sustainability Plan that includes baseline data, targets, policies, and monitoring, auditing and reporting systems. Based on the results of the gap analysis, ACC used the Toolkit’s 13-step approach as a guideline to address identified gaps. For example, a non-composition waste audit was performed to establish the baseline of non-hazardous waste generation at the ACC warehouse and office. Based on the baseline data, a 25% waste recycling rate target was set to be reached by mid-July, 2016. In order to achieve this goal, an employee education and training action plan is being developed. Stakeholder engagement was another important metric for ACC. The Sustainability Toolkit provided a guideline for ACC to engage stakeholders to better its sustainability performance. A sustainability employee engagement survey was carried out to investigate employees’ awareness and confidence in ACC’s sustainability initiatives. The survey results also served as stakeholder engagement baseline data. In order to encourage employees to share sustainable ideas and to express their enthusiasm for the implementation of sustainability projects, the Together We Grow sustainable idea sharing competition was established in June, 2015. 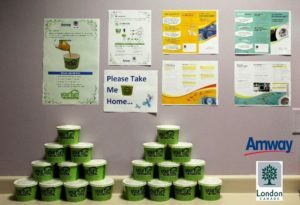 Employees were divided into teams and sustainable ideas as well as green tips were shared and posted on a tree poster. The Sustainability Coordinator and Environmental Steering Team implemented one of the ideas – introducing FOG (fats, oils and grease) cups to ACC. Starting in July 2015, ACC has been working with the City of London on the Your Turn FOG Cup program which helps to keep fats, oils and grease out of the City’s sewage system. By the end of August, ACC had taken in hundreds of FOG cups and distributed the cups to employees. In order to engage Amway IBOs – an important stakeholder group – and help them live a more sustainable life, Amway’s sustainability initiatives were shared on Mark & Lin Ma Day; a day of training, recognition and celebration held at ACC for one of the largest IBO organizations in Canada. Following the presentation, FOG cups were distributed. The IBOs were so impressed with the presentation that Mark Ma has since approached the city of Markham, requesting that they implement FOG cups in that city. As a next step, ACC is recruiting members to join its Employee Engagement “Green Team’ sub-committee to help with sustainability planning and implementation. The Green Team will be working on a variety of initiatives, including the sustainability board, recycling training sessions, a sustainability photography competition, and much more. The Sustainability Toolkit was an excellent guideline, enabling ACC to assess its current level of sustainability, identify and fill gaps, and to step forward with a more comprehensive sustainability plan. The Toolkit also acted as a ‘bridging’ framework connecting ACC to Amway Corporation and its other international affiliates to implement a corporate environmental policy and share sustainability best practices. The research for this case study was funded with the support of a Mitacs Accelerate grant. For more information on the research project, please view our blog and white paper.